Jonah wrote a post about how awful the band Brokencyde is, and I mostly agree with the points mentioned. However I would also like to propose that if you aren’t particularly talented, it is more profitable to be epically bad than it is to be just moderately bad or even mediocre. I also think it is more entertaining and useful to society as a whole, thus being the utilitarian venture to embark upon if you aren’t traditionally talented. So let’s begin my defense. You become interesting again! The market actually becomes LESS saturated as it becomes challenging to be worse than that threshold. You have become so awful that you are fascinating and captivating, entertaining and hilarious! Sure, the chance that a random person buys your product has now dropped by an order of magnitude or two, but your exposure increased by many more. You aren’t quite playing with the big dogs, but you can sell leaps and bounds more than the average guy. 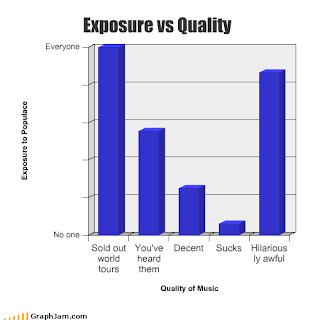 All for being notably worse than most other bands. So clearly it can make sense selfishly and financially to be a Brokencyde or a Williang Hung, but are you harming society in the process? I don’t think so. Surely a few people will legitimately be offended and wish such bands didn’t exist, but I think the majority of us are at least entertained by their existence which makes us laugh or smile, have an interesting discussion with friends, or at least have a great gag gift (another unique sales niche these bands get in on). As a result, individual Brokencyde’s of the world increase the overall happiness of society more than an individual “average” band. Sure they’re bad, but would we (or they) want it any other way? Our first album is at least 10 times as bad as anything on there.